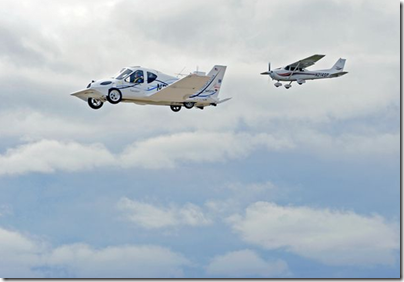 Today's flying cars use the metaphor of a plane. Haven't they missed something? ...but shouldn't they function more like this? Today's flying cars use the metaphor of an airplane and often look similar to the Terrafugia just launched to market at Automotto on April 7, 2012. But it is unclear how widespread this type of car will become. Most consumer's commutes are less than 30 minutes. Many would love to escape the traffic - yet few have the time or inclination to acquire pilot's licenses. Could we be using the wrong metaphor? Isn't the average consumer looking for something that won't require a new driver's license. Something that virtually pilots itself? 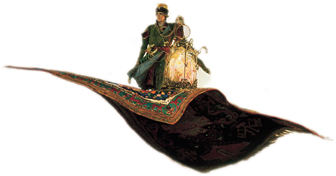 Something like the fabled flying carpet. 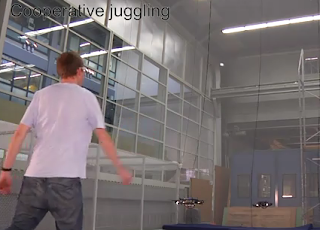 Already we are seeing quadrocopters with control and stability systems sophisticated enough to play catch with humans (or each other) that are automated. 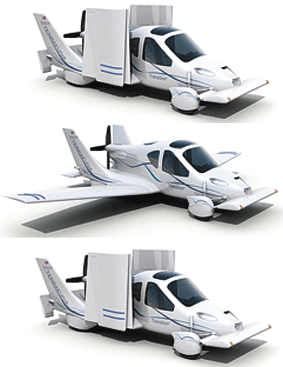 Today's flying cars have two engines - either of which if failed - could result in a crash. One interesting feature of quadrocopter design is that if one of the four quadrocopters failed - the other three can still land properly. But why stop with just four engines? Quadrocopters have been coordinated effectively to fly in coordinated swarms of twenty - successfully navigating obstacles and between each other in ways that exceed human ability without training. What if this approach of multiple engines for redundancy were extended to increase safety and stability through an entire "carpet" of quadrocopters so that multiple blades could fail and the system could still land safely. What is the flying car for the masses? Perhaps it will look more like something like this. Of course, taken to it's logical extreme of miniaturization, one could imagine nanofabric propellers. Applying an electrical charge to the fabric could power millions or trillions of tiny rotors. Woven into clothes - they would be self-air conditioning. Stretched into a sheet - the fabric could generate loft. But how much loft is possible - and how close are we today? What about safety in cases of catastrophic failure? Consider wearable airbags: Airfall Airbags. How might such a system help traffic? Consider that if we just used the air space fifty feet up in a planar fashion, the traffic could split between the ground and the sky and traffic would be half. Use the layer 25 feet above that and the traffic is now 1/3rd as dense. Truly, the sky is the limit. 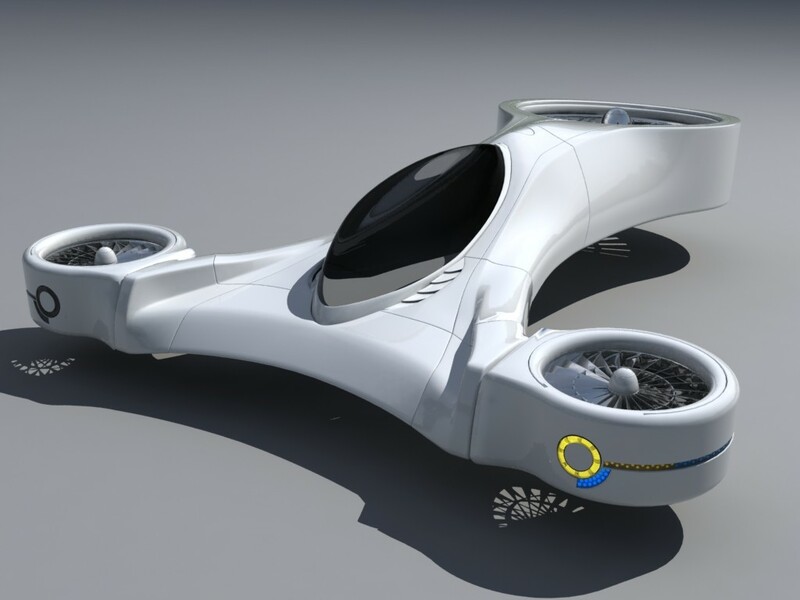 How far are we away from this flying car vision? October 21st, 2011 was the date of the first manned flight of a "multicopter" by eVolo. It required just 16 blades and flew for 1 minute and 30 seconds. So how close are our flying cars? E-volo, the German team that flew the manned, electric, 16-rotor multicopter in October, will launch a two-seater version this spring — and a commercial model will go on sale in 2013. 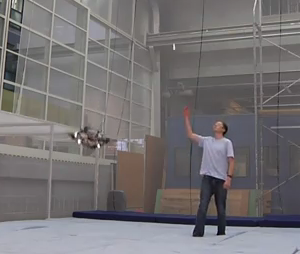 The test flight only lasted 90 seconds, but according to E-volo the multicopter is capable of flying for 20 to 30 minutes on a single charge. Of course, future designs could make ownership more exciting for some. How could this change healthcare? Multi-trauma patient transport might never be the same. Multicopters could be carried with ambulances or reach scenes helicopters cannot. Ambulances could stabilize patients in the field, place them on stretchers mounted on multicopters. Patients could be lifted from the scene and taken to the nearest hospital - avoiding roads - and taking the most direct route. One can imagine seeing patient after patient being lifted from the scene simultaneously - while other multicopters return for additional people. A two man version could enable a single paramedic to care for the patient while in transit. How long until the first patient arrives by multicopter? Of course, it is not just those interested in healthcare that autonomous deliver has excited. 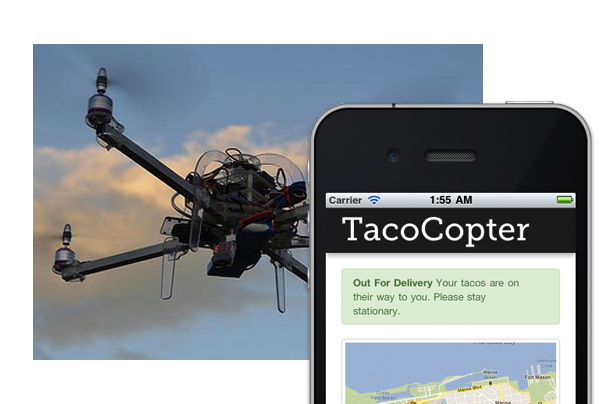 Some are anticipating a "revolution" in food delivery as well. 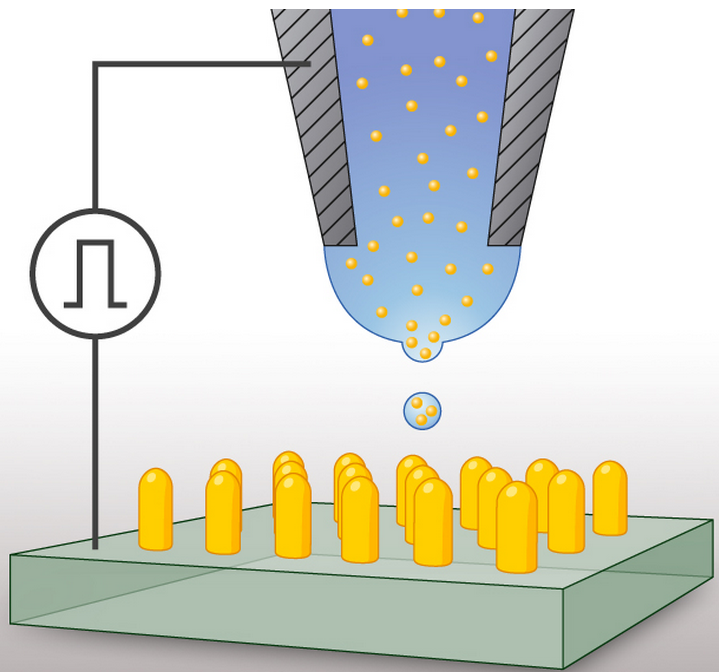 ETH-Zurich researchers have developed an economic, fast and reproducible method for printing micro- and nanoscale (<100 nm) structures in a manner similar to an ink-jet printer printing art. The trick: ultrafine particles are transferred onto a surface from a capillary with the aid of an electrical field. Depending on how long material accumulates at the same spot, the structure can be a dot or nano-tower, or even an arch. Surfaces modified with nano-structures can absorb, concentrate and transmit light instead of reflecting it. Increased efficiency of thin-film solar cells by capturing the light and channeling it directly towards the active layer, for instance, instead of reflectng part of the light and letting another part escape unused. New kinds of faster, more selective and highly sensitive detectors and sensors might be feasible. Special light microscopes in which light nanoantennas trigger fluorescence, enabling individual molecules to be observed. 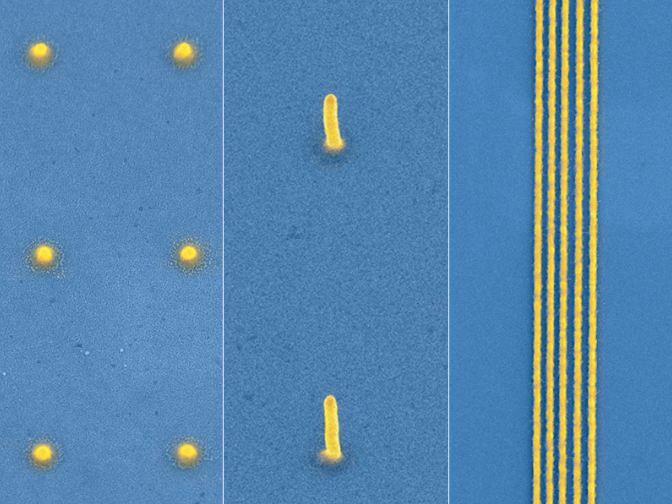 Wherever material needs to be applied on a nanoscale in a targeted fashion — a CPU printed on the spot, for example. 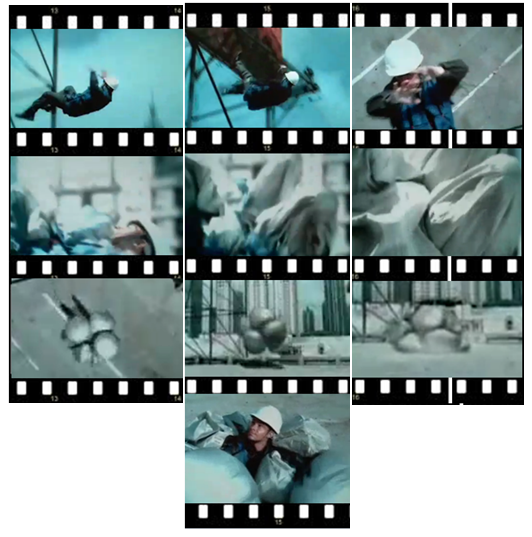 Structures can be applied to different surfaces in a quick and reproducible manner. Fast because the printer can be programmed in such a way that material is applied precisely where it is needed. Removal and waste of excess material no longer required. Less expensive — no large-scale facilities, high calssification cleanrooms, exceedingly high temperatures or special pressure ratios, and laborious and time-consuming vacuum steps. Throughput and size of the printed surfaces may be increased considerably during industrial production. Prototyping at the smallest scale could be performed fast and affordably. The researchers next plan to develop a print head containing several individually addressable capillaries to increase throughput and enable stacking layers of different materials. Infrastructure that could be used in the EMS dispatch space...from Google. Samsung is getting behind NFC (near field communication) in a bigger way with stickers that interact with your phone. In a demo, Samsung held the Galaxy S III demo device in front of a sticker, one that happened to be attached to a business card, and contact information appeared on the screen. 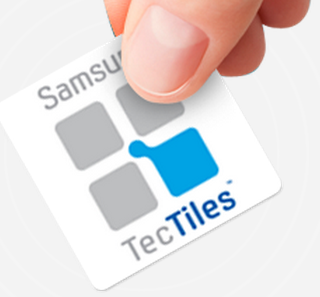 These TecTiles, as Samsung calls them, have a tiny nub of an NFC chip embedded within. Like other NFC stickers, TecTiles rely on near-field communication technology to communicate a set of instructions. The stickers, which Samsung will sell in packs of five at each of the Big Four carriers' retail locations ($14.99), correspond to a free Android app that is responsible for the actual programming. With them, you'll be able to set a TecTile to set your alarm, check into a social network, auto-compose a text to a particular recipient, turn the phone to driving mode, and so on. In some cases, you can mix and match tasks within the same category, so that tapping the NFC-capable phone to the sticker you've affixed to your bedside lamp turns on night mode and the alarm, and tapping it again toggles them off. Likewise, a TecTile on your car dash may toggle car mode while also engaging Bluetooth for calls. You can reprogram the stickers to your heart's content, and the free app will work with the Samsung Galaxy S III, Galaxy Nexus, Galaxy S II, Galaxy S Blaze 4G, and Nexus S.
You'll also be able to download and use the app and TecTiles on non-Samsung phones, so long as they're NFC-enabled, like the HTC One X. With TecTiles, you'll also be able to display a message of your choice on someone else's screen, place a call, launch an app, open a URL, check into Facebook, automatically "like" something on Facebook, follow a Twitter contact, and connect on Linked In, among a few other tasks. 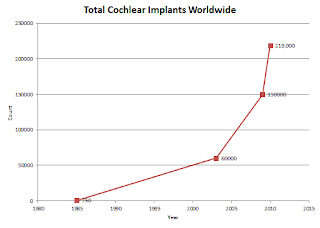 ....I found reports on the total worldwide count of cochlear implants. 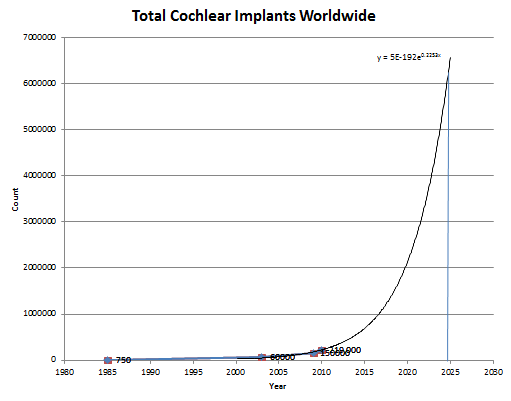 The trend for cochlear implants worldwide is not only exponentially increasing - but accelerating. The doubling time has increased from every five years to every two years now. 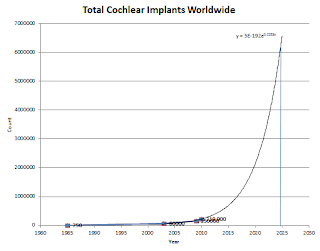 Depending upon when this curve turns sigmoidal and the degree of commoditization of components creating affordability in the developing world, nearly every person worldwide who is deaf (6.6M) could potentially have an implant within the next 12 years. 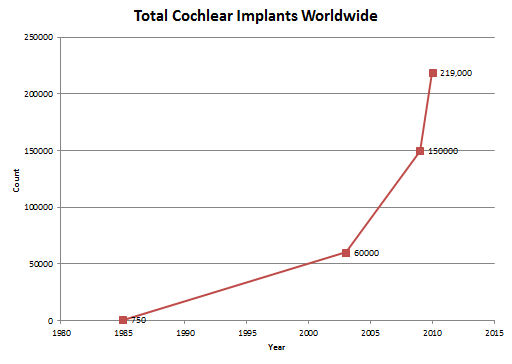 A plot of cochlear device fidelity might also give a hint as to what year implants could exceed the volume range or fidelity of the human ear. Perhaps the Six Million Dollar Man is closer than most thought.